Most people have eye problems; some are minor and heal on their own or are easy to treat at home, while others need a specialist’s care. These eye problems can be treated by using eye drops and lubricants that are effective and less painful. These are used for the treatment of eye diseases and disorders such as dry eye, redness, itching, soreness, glaucoma, conjunctivitis, refractive errors, diabetic macular edema, CMV retinitis, and age-related macular degeneration. The global eye drops and lubricants market is expected to register substantial growth in the near future, owing to the rise in prevalence of ophthalmic disorders worldwide and change in the demographics across the globe. In addition, drug discovery & development is expected to boost the market growth during the forecast period. However, risk of side effects associated with ophthalmic eye drops & lubricants and stringent rules & regulations are expected to hamper the market growth during the forecast period. Conversely, increase in investment by eye drops and lubricants market players in the emerging economies is expected to offer remunerative opportunities for market players. The global eye drops market is segmented based on type, application, and region. By type, the market is categorized into antibiotics, hormones, artificial tears, and others. Based on application, the market is divided into eye diseases, eye care, and others. The eye diseases segment is further classified into dry eye, glaucoma, conjunctivitis, refractive errors, and others. Based on region, it is studied across North America, Europe, Asia-Pacific, and LAMEA. Based on type, the eye drops and lubricants market is segmented into antibiotics, hormones, artificial tears, and others. The artificial tear segment accounted for the highest revenue in 2017 and is expected to continue this trend throughout the forecast period, owing to the rise in the demand for the product, due to surge in number of dry eye syndrome across the world. Furthermore, easy availability and accessibility of lubricating eye drops further fuels the market growth. However, the hormones segment is expected to register the highest CAGR during the forecast period, owing to the high incidence of dry eye in postmenopausal women and Sjögren's patients across the world. This increases the demand for the hormone eye drops and lubricants in the market. Depending on application, the eye drops and lubricants market is categorized into eye diseases, eye care, and others. The eye disease segment is the largest contributor owing to the rise in prevalence of eye disease globally and increase in the geriatric population who are more prone to suffer from these eye disorders. Eye care is expected to be the fastest growing segment due to the rise in number of cataract and other eye-related surgeries that require the use of eye drops after surgeries. In addition, the rise in awareness regarding the importance of eye care also help boost the growth of the market for eye drops and lubricants. Region wise, the eye drops and lubricants market is analyzed across North America, Europe, Asia-Pacific, and LAMEA. North America accounted for the highest eye drops and lubricants market share in 2017, and is expected to maintain its dominance throughout the eye drops and lubricants market forecast period, owing to increase in prevalence of glaucoma, cataract, and other ophthalmic disorders. However, Asia-Pacific is expected to emerge as a lucrative area with maximum growth potential, owing to the rapid development in healthcare infrastructure, rise in incidence of ophthalmic disorders, and increase in healthcare initiatives by its government. The report provides a comprehensive analysis of the key players operating in the global eye drops and lubricants industry, namely Akorn Consumer Health (TheraTears), Allergan Plc, Johnson & Johnson, Novartis International AG (Alcon Inc.), Pfizer Inc., Prestige Consumer Healthcare, Inc., Sager Pharma Kft., ROHTO Pharmaceutical Co., Ltd., Similasan Corporation USA, and Valeant pharmaceuticals International, Inc. (Bausch & Lomb Incorporated). The other players in the value chain include Jawa Pharmaceuticals Pvt. Ltd., Maya Biotech, Neiss Labs Ltd., Hanuchem Laboratories, Oculent Healthcare, and others. This report provides a detailed quantitative analysis of the current eye drops and lubricants market trends and shareforecast estimations from 2018 to 2025, which assists to identify the prevailing market opportunities. An in-depth eye drops and lubricants market analysis includes analysis of various regions is anticipated to provide a detailed understanding of the current trends to enable stakeholders formulate region-specific plans. Region-wise and country-wise eye drops and lubricants market conditions are comprehensively analyzed in this report. Key market players within the market are profiled in this report and their strategies are analyzed thoroughly, which helps in understanding competitive outlook of global eye drops and lubricants market. 7.6. PRESTIGE CONSUMER HEALTHCARE, INC.
7.8. ROHTO PHARMACEUTICAL CO., LTD. The global eye drops and lubricants market generated $15,587 million in 2017 and is projected to reach $22,625 million by 2025, growing at a CAGR of 4.7% from 2018 to 2025. Eye drops and lubricants are used to relieve people suffering from various eye problems such as eye dryness, redness, infection (pink eye), allergies, itching, soreness, swelling, and others. Mostly, only one drop needs to be placed in each eye. However, in cases, where the patient is prescribed more than one type of eye drops, it is advised to maintain at least five minutes gap between each type of medicine. The eye drops and lubricants market is expected to exhibit significant growth during the forecast period due to the rise in prevalence of ophthalmic disorders worldwide and change in the demographics across the globe. In addition, drug discovery and development further supplements the market growth. Based on type, the market is segmented into antibiotics, hormones, artificial tears, and others. 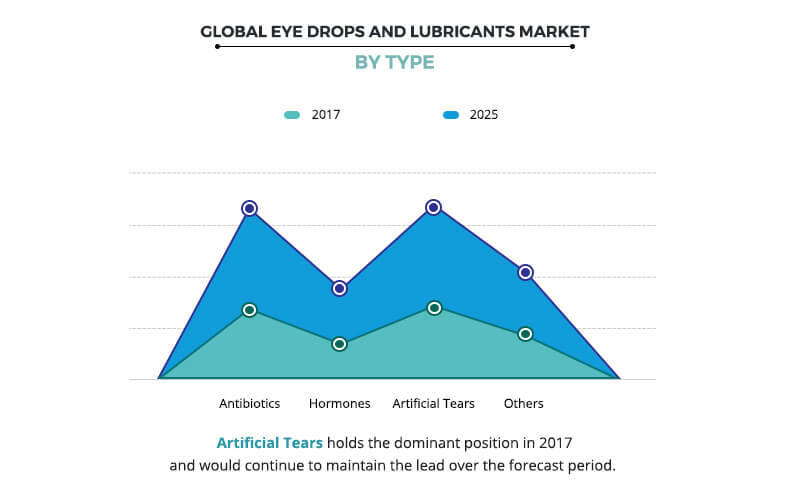 The artificial tears segment was the major revenue contributor in 2017, and is anticipated to continue this trend during the forecast period due to rise in number dry eye syndrome among the all aged population across the world. These artificial tears add moisture to the eyes to relieve from discomfort. Furthermore, the easy availability and accessibility of lubricating eye drops even without a prescription further fuels the market growth. On the other side, the demand for hormones eye drops is projected to exhibit the fastest market growth during the forecast period owing to the high incidence of dry eye in postmenopausal women and Sjögren's patients across the world. Based on region, the eye drops and lubricants market is studied across North America, Europe, Asia-Pacific, and LAMEA. North America is the highest revenue contributor to the market due to high awareness and adoption of eye drops in the region. Europe is the second largest revenue contributor due to continuous adoption of new technology in the field of drug discovery and development. The Asia-Pacific region is expected to hold the highest growth potential from 2018 to 2025; this is due to the presence of large number geriatric population who suffer from cataract, glaucoma, refractive errors, and others. "Eye Drops and Lubricants Market"